Our group examines the cultural state of astronomy and STEM fields in general. 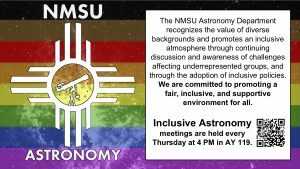 We meet weekly to discuss how to make astronomy a more inclusive and welcoming environment for everyone, including traditionally underrepresented and marginalized groups. View our weekly meeting notes here. Topics discussed include unconscious bias, the confidence gap, impostor syndrome, harassment, and microaggressions. We are promoting the education of our department on these topics by giving department presentations and providing training opportunities. To encourage a welcoming and supportive environment, we are currently expanding the support resources available to students. See our post about our achievements for more details. Check out our posts on our recent discussions and our meeting schedule.